Active travel is an alternative, for small trips (less than 5km or about 3 miles) to using the car. These small trips are mainly to work or school or shopping. Active travel is the ability to safely walk or cycle these trips. Currently there is limited infrastructure to enable safe cycling or walking. There are no high grade cycle paths and pavements get blocked by parked cars. Consequently people are forced to use a car. This a tool, originally developed by Rachel Aldred at Reading University that maps the responses to the 2011 Census which gathered both home addresses and work place addresses as well as method of travelling to work and the same for school travel. By taking just this information it was possible to map who travels where and calculate which routes are used by how many people and what different scenarios of cycling level improvement would do to the levels of cycling. The background colours show the levels of cycling as per the legend in the top left hand corner. The thickness of lines shows which routes are most used for short trips. The tool shows the numbers for each line. These are statistics for Cornard Road. Cornard Road has a substandard cycle path. It is a shared path, but on a footpath far too busy to be used as a shared path. It has no safe access to it for cyclists travelling south-east and has entirely the wrong path markings that were done it seems freehand by someone with sub primary school art skills. But you can see 1629 commuters used this route in 2011. Only 101 cycled (which is far less than 1%) the difference between the total commuters less cyclists and the number of drivers is made up of pedestrians which backs up the argument that it is too busy to be used as a shared path. Government Target - This is the UK Government target of doubling the average share of such trips. 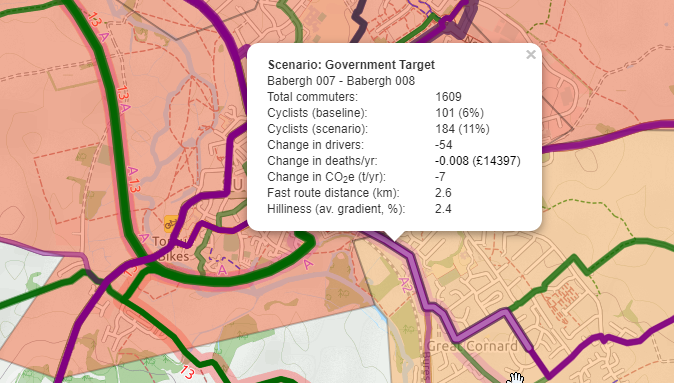 The scenario tool just calculates how many drivers would need to switch to achieve this level. Government and Local Authority current policy is not to fund any cycling infrastructure outside six cities. This target is thus unlikely to be achieved elsewhere and indeed cycling levels outside cities is declining. Gender Equality takes the number of women (who currently do not represent half of all commuting cyclists) and calculates based on an equal number of men and women. Go Dutch is like the blue skies vision. Every route offering safe cycling infrastructure to enable people to safely switch, the average of commuters in the Netherlands is 26.7% and this demonstrates what would happen if this was achieved. One thing to note is that more women cycle in the Netherlands than men so it reflects that as well. The calculations take into account hilliness, the hillier the route the less likely for people to switch. E-bike is an extension of Go-Dutch and takes out the hilliness adjustment. The results are much higher. As you can see the extremely conservative approach (of actually doing nothing except talk and issuing cycling maps) achieves a very modest reduction of 54 drivers (note that is 54 drivers off the road) so more road space for other drivers. However a caveat that since this target was announced commuting has reduced according to other statistics. Notice how the map turns blue instead of shades of red. 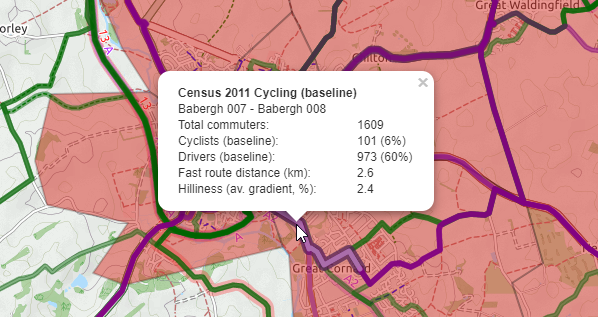 This shows cycling levels are over 15%. The figures are interesting. 436 cars removed from the road in the rush hour. (to give you an idea with proper gaps between cars this would probably stretch from the Melford Bypass to Belle Vue Junction. Resultant decreases in deaths per year due to exercise and less accidents. The NHS would now really reap the benefits. Cyclists take less days off sick and visit their doctor rarely. At these levels of cycling you have hit a tipping point where roadspace needs to be allocated to cyclists and taken away from drivers. Note also the use of Valley Walk and a route to Cornard along the river. Imagine how happy someone cycling along there on warm day would be and their mood when they arrived at work. This is the blue skies vision. But technology is improving so lets introduce Electric bikes into the equation. Introducing ebikes into the equation means cycling is 10 times what it was in 2011. Everyone can cycle irrespective of fitness levels. Economic benefits now really hit home. Shops would see a massive increase in footfall. (despite what is repeatedly said drivers do not translate into footfall unless they can easily park). The traffic would now be flowing nicely in Sudbury (even a 10% decrease in cars is a noticeable change). Sudbury would become a destination. The railway would get a boost and undoubtedly other nearby towns. But we are concerned about the bypass. What would this look like for traffic from Ballingdon to Melford? The stats here show so few people make this trip that it makes further analysis pretty pointless. It also means very very few cars would use a Western Bypass. Does that mean noone travels up or down Ballingdon Street for short trips. not a bit of it. There are other listed routes with several times that level of traffic. But that means they are all headed for Sudbury instead of Melford, so would not use a bypass either. Looking at the traffic from Sudbury to Long Melford via Melford road there is far more traffic. Again its destination or origin is Sudbury Town Centre so they would not use a western bypass. 742 cars provides ample propensity for modal shift so it's worth analysing what would happen. This is a really interesting change the number of cars (drivers) has fallen but equally the number of cyclists has increased tenfold. If Valley Walk was usable all year round in all weathers this would clearly be the result. at a saving of £68k per annum just for deaths per year from inactivity/accidents etc the payback on putting a surface on Valley walk would be very swift indeed. That improvement would take zero roadspace away from cars as well. Sometimes things look like a no-brainer. This is one of them. The potential for reducing traffic and consequently traffic congestion and pollution via modal shift, just to cycling,in the Sudbury area is huge. The footfall benefits would improve the local retail economy, the health benefits would almost certainly produce a CBA that would pay for the improvements inside 15 years, a far faster payback than any Bypass project could ever hope to achieve. Plus, while we get some cycle tourists in the area they will flock to use the new infrastructure and use Pubs, hotels, cafes, shops and museums. The work can be staged. Build the bridge at Bakers mill and install a segregated path from Great Cornard to Sudbury Kingfisher along the river bank. Put a surface on Valley Walk from Sudbury Kingfisher to Rodbridge Corner, segregated wherever possible, as a shared path where not possible. Improve all the access points and fix all the small annoyances that hinder cycling in the Town Centre. Create an off road cycle route from Sudbury to Great Waldingfield and Acton using the Airfield runways. Create a segregated path from Melford up Springlands Way to Northern Road Industrial Estate so people can get to work by bike. As people switch to cycling in greater numbers (there is absolutely zero evidence this will not happen) then start providing segregated paths alongside busy roads such as Waldingfield Road and East Street and possibly Melford Road. This will take us to Dutch levels of cycling.